A week before my surgery I received three phone calls that almost, ALMOST made me change my mind! The first was from my Drs. office exactly a week and a day before my scheduled surgery. "We've had a cancellation for tomorrow, (May 21) would you like to come in a week earlier and have your surgery done?" As I pulled my freaking heart out of my throat I remembered the main reason for having my surgery done when it was scheduled, my husband's vacation, and I told her I'd have to stick to my plan because there was no way he could change his vacation. Phew.... one down. The second call was from my local blood bank on the Thursday before my surgery. "Has your Dr. spoken to you about donating your own blood for the surgery?" Well, he hadn't, but I had read the literature and so I did know about it. "It looks like you would need to donate either today or tomorrow so we can have that on hand for your surgery. My surgery was the Tuesday after Memorial Weekend and that is why. "Or, we could have you use shelf blood." I tend to be anemic anyway to at this late date, and not wanting to be anemic for my surgery, I opted for shelf blood. As I hung up the phone I was thinking, HOW MUCH BLOOD AM I GOING TO LOSE ANYWAY!!?? Once you hear those words, you can't stop thinking about it and my brain played this "track" over and over for the next several days. The third call was from the hospital as a pre-op phone call. They went over my paperwork, insurance coverage, any allergies I may have, etc. 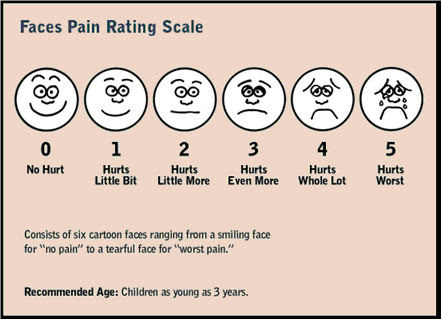 Then she said, "You will want to familiarize yourself with the pain scale. Have you ever seen the new pain scale? It has these faces along with the numbers from 1 - 10 and when you are asked your pain, you need to be able to tell the nurses so they can get you the right medication level." Pain, I think that was first on my list of fears. Oh man, this IS going to be painful. Now I'm terrified. I hate pain!! I've been in pain for a long time now. Well, I guess if it's painful, it will be the last pain I will be feeling as it heals. Still though.... I was expecting to be at a 5 for a good long while. Tuesday the 28th came up pretty fast after Memorial Weekend. Monday I was very calm. It was as if I knew everything was going to be OK. Tuesday, Wes and I got into the car for the 40 min. drive up to the hospital. I had to be there at 6 with a scheduled surgery time of 7:30. The nurses were very efficient and within a very short time I had been hooked up to the IV and monitored and given a blood thickening shot that was to help with blood loss during surgery. The anesthesiologist came in asking about any allergies. My words to him? 2. Please don't let me wake up or remember anything!! 3. No pain, no pain, no pain." $. Did I mention, DON'T LET ME DIE!! The next thing I know, I was being wheeled into surgery! It was so fast. Of course, I got to see everyone in there as I wheeled by AND I got to see the surgery table.... cool and OH MY GOD... THIS IS FOR REAL!!!! Next thing I know I was breathing oxygen and getting a relaxing addition to my IV and that was it. "Surgery is finished and you did great Mrs. Weems." Music to my ears! Wait, where is the pain? Oh, there is none. They probably keep it that way for a while. I was aware pretty quickly and they brought me juice and food and sat me up and still nothing hurt. I couldn't believe it was all over. Thank God! So I really lucked out pain-wise for that day. The Hospital's Helipad. Oh, he swears to me he was in the lobby and had headphones in because he was watching a movie on his Ipad. But I think I know better. "Well, that would be hard to do since you don't have staples!" "Oh, then it could have been a stitch?" "Nope, you don't have those either...."
"WHAAAAAT??!! What the heck is holding my incision together?" Wow, that means the incision is going to look really fine lined!! SWEET!! Have I mentioned yet that my RN was a man? Steve. I'm kind of a modest girl and knowing just what kind of things a nurse does, well, I was scared. Come the middle of the night, guess what they had me do? "Mrs Weems, you need to try and urinate now." Oh come on!! I don't even feel like I have to. So in comes the bedpan and I was told how I needed to use the pull up bar above me to pull my bum up so the pan could be placed. And this was really cute, he ran water in the sink and told me to pretend it was a little running brook. You must know how running water makes you feel. I don't know if I hadn't drank enough water or what, but that was the hardest thing to do!! I finally achieved, thankfully, and was allowed to go back to sleep. But let me tell you, Steve was kind and it was almost like my husband helping me. I wasn't afraid or shy and over the next couple of days, I came to realize that having a male nurse was just fine. Not very pretty, I know, but I think this was taken shortly after my return from surgery. See.... smiling ALL the time now! I had heard Day 2 was more painful that Day 1 so I was braced for the worst. But the next morning when I woke up, still no pain. This was the day to get up and WALK to the bathroom, which I did with the help of my nurse. My leg under me was strong and again, no pain. Later that morning, Victor, the hospital's physical therapist, came to get me for my big walk down the hallway. 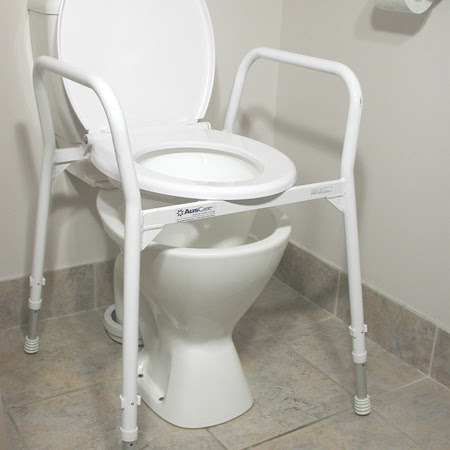 I put on my robe and was belted around my middle (just for safety purposes) told how to use the walker and we were off! How can this be??!! It's only been a little over 24 hours and here I am WALKING the hospital hallway, quickly and with no pain??!!! I was ever so careful because of all the stories I'd heard about dislocation, but man, this little leg of mine.... it was SOOOoooo very strong! I had two physical therapy sessions on Day 2, morning and afternoon and the same with Day 3. Have I told you yet how much I had been smiling up to this point. SMILING!! I am STILL smiling almost every minute of every day!! When I got back to my room there was a woman there to hand me a bag of "tools" and teach me how to use things like grabbers, extended shoe horns, a little device to help put on socks, etc. It was like a little mini class on how to dress yourself. On day 2 it was mostly showing me how to use everything. On day 3, before I went home, it was more like, now I had to use these items and show her I was paying attention. On this note, I would like to say, I did pay attention and I thought I would probably not be using the items once I got home. WRONG!! By having the knowledge on how to use them and using them, I recovered just that much quicker because I could do things for myself! My husband only had 1 week of vacation and I knew I would have to be up and practically myself before he went back to work. So still no pain, although it was stressed to continue with pain medication because, "You want to stay ahead of the pain." Day 3 dawns and my Dr. comes to see me and says, "You are being released today. You will have a Home Health Care person come twice a week to help you at home. 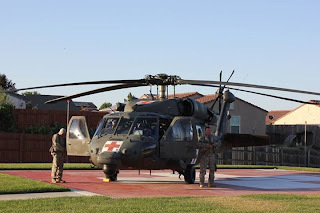 Be sure to take your blood thinner and I will see you back in my office on June 23, about 3 weeks after surgery." Then he asked how my stay had been and how my nurses were. "GREAT!" He said if I thought so, I might want to eventually write the hospital and mention people by name that had helped me. "Of course, I was already planning on doing that... my nurses, physical therapist, etc. were fantastic!" And he sat in that chair next to my bed and seemed so humble! I mean, here was the Dr. who really changed my life for the better and he is telling me to thank others? All his training, education, experience, attention to detail to make me better and he is telling me to thank others. Well of course I would, but my Thank You to him was going to be FIRST!! "Nope we can't have a zero, so I guess we will make it a 1." "Well, if we must.... but I'm feeling no pain whatsoever." Here I had thought I would be in agonizing pain and nothing. Well, once I was home, that may change, but I was going to stay ahead of the pain like I was told! Bottom line, my hospital stay was perfect in every way. My room, although it had two beds was basically private. When I pushed the call button, my nurse was right there, no ringing for 15 minutes. Night, well if you've ever been in the hospital you know about the noise... Dr. calls, ringing call buttons, patients maybe making noise, people coming in and out at shift change. 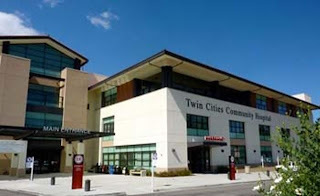 Well, Twin Cities Hospital in Templeton, CA was totally different. It was quiet! I was able to actually sleep and heal. The food was good and healthy. Staff was always friendly, right down to the woman who came to clean and mop. She was so sweet and friendly. Thursday, the 25th of May, I was on my way home. The next phase of my healing. What would THAT be like. Walking around in my home environment, using the potty (which we changed to the raised seat kind OVER my existing toilet so I didn't have to squat so far). Adjusting and getting back up to speed so I could take care of myself. I was going to need to heal quickly! I thought I was ready for just about anything and it was going to be so nice to be home with my family. BUT..... no one told me what to expect on the 7th and 9th day AFTER I came home.